For every state vagrant that shows up at a feeder or in a public park, there seems to be one that turns up in a logistically impossible part of the state. North Carolina is perhaps unfortunate to have a lot of such places. Along our sizeable coastline there are a great many islands that are more or less impossible to reach unless you have a boat and an Off-Road Vehicle on the other side. Or if not the vehicle, you’re willing to walk a lot. Researchers doing shorebird surveys on the Core Banks (that is, the section of coast between Cape Hatteras and Cape Lookout) had a tendency to find some interesting stuff. Unfortunately, it’s stuff that birders have little chance to chase. 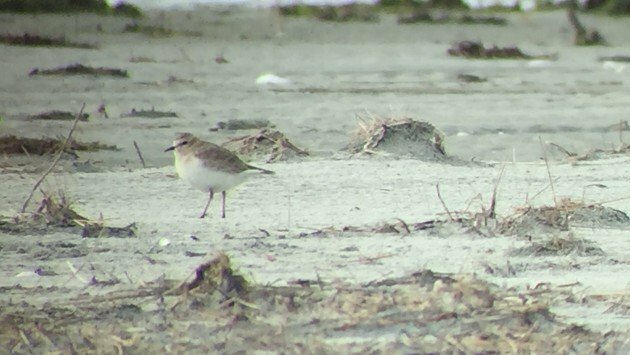 So when a potential state 1st record of Mountain Plover, only the 4th such record on the east coast, turned up on one of these islands, I assumed that it was one of those birds we’d have to envy from afar. 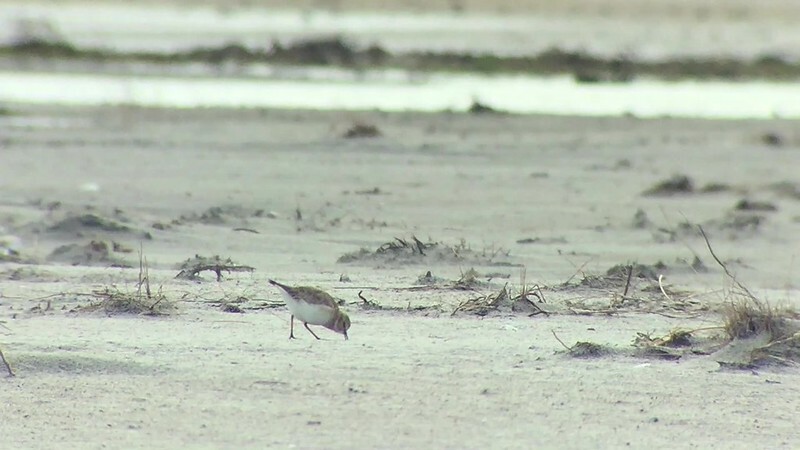 The finder was seeking wintering Piping Plovers when he encountered it, took the photo, and made it public a couple days later. It had all the makings of a classic grip. I admit I underestimated the resolve of North Carolina’s listing community. It wasn’t long before birders had tracked down a captain in the little town of Sealevel who was willing to ferry birders the short 20 minutes ride over to the island for $25 a head. The first group to use him had great success, finding the bird in no time along with a Long-billed Curlew, another great bird for the southeast. Now the only thing to do was to make the long drive down to the coast and see for myself. I rolled out of my driveway at 4 AM, to try and make a boat at 9. The hours rolled past. Daylight broke around New Bern and the view turned to acres and acres of saltmarsh as I wound my way through this part of the state where I had spent far too little time. I was the first one at the dock, but it wasn’t long before a handful of other birders arrived and we began making preparations. It was a beautiful day, and the trip was a breeze. We made landfall and immediately started panning for the bird in the higher dry sand where it preferred. We found it in about 15 minutes. Mountain Plover is a remarkable little bird. I saw my first on the short grass prairie of Colorado, in the shadow of mountains. It’s cliche to talk about how strange it is to find vagrants in places you don’t expect, but I’m going to do it anyway. Here, with the roar of the wind and the sea and Gannets and gulls foraging in the sound not more than a couple hundred meters away, was not a place for a Mountain Plover. But it had found the closest thing to a short-grass prairie in several hundred, possibly thousand, miles. A patch of dry sand above the tide line, specked with clumps of grass and tiny dunes. And here it did what Mountain Plovers do, scurrying across the landscape, picking up bits of food here and there. My boatload of people, having seen the bird sufficiently, headed back. The boat captain told me he’d be bringing another group out in a little bit so I decided to stay on the island, alone, and go back with them. I wanted the curlew, and, truth told, the strange feeling of seclusion. I got the second, but missed the first. When the wind picked up in the afternoon, the bird found a lump of sand and tucked in behind it. It practically disappeared into the sand like I imagine they do on the prairies, too. The next boat came, I got the birders on the plover, and we all headed back with smiles on our faces. Congrats on an awesome state twitch. Kudos to the birders and boat captain who helped make that happen. What was the Captain’s Name and contact info that you used?